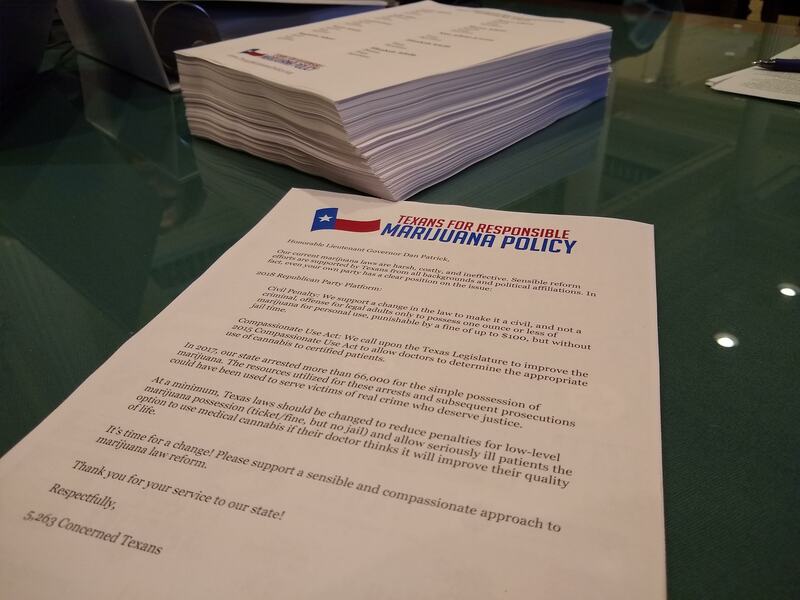 Last week, a spokesperson for Lieutenant Governor Dan Patrick told the Texas Tribune that he is “strongly opposed to weakening any laws against marijuana [and] remains wary of the various medicinal use proposals that could become a vehicle for expanding access to this drug.” This afternoon at the Capitol, in a meeting with his staff, we hand delivered over 5,000 signatures from Texans requesting he reconsider his stance. Please support our work at the Capitol​! Now more than ever we must be unified behind this important issues. Lt. Gov. Dan Patrick is out of step with Texans on this important issue, including his own political party! 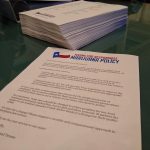 The vast majority (80%+) of Texas voters support some kind of marijuana law reform this session and at their state convention last year, delegates to the GOP state convention adopted official positions supporting a civil penalty and letting doctors decide about medical cannabis. Recently, the Texas Police Chiefs Association (TPCA) held a press conference about marijuana at the Texas State Capitol. Chief Steve Dye recommended, “Do not expand the use of medical marijuana unless validated, peer reviewed medical research shows a proven medical benefit and that it can be prescribed by a medical profession for a condition that cannot be treated with an existing legal medication,” on behalf of TPCA. Please support our efforts at the Capitol​! Support Medical Marijuana in the House​ and in the Senate​. Rep Lucio III’s HB 1365 currently has fourteen coauthors! Support Penalty Reduction in the House​ and in the Senate​. Thirty-three legislators have joined Speaker Pro Temp Moody’s civil penalty bill, HB 63. Support Hemp in the House​ and in the Senate​. If passed, these bills will create a regulatory/licensing infrastructure so Texas farmers can grow hemp. Write a letter to your local police chief to ask them to support letting doctors decide who needs medical cannabis. Thank you for helping this important legislation gain more support.